If my hands were non-stick frying pans they'd be the market leader. I'm constantly licking and spitting on my hands when shuffling, sleighting and generally whenever I handle cards. having to constantly dampen my hands through routines breaks any smoothness of rhythm I want to portray. As a health professional constant phlegm application doesn't sit well with me regarding infection control and... well... just common hygiene. I don't think it's a great look either. As a spectator I think I'd be grossed out by a magician constantly licking his fingers/palms. Are there any favourite liniments, creams or age old secret solutions for Teflon hands? Any other advice/pearls of wisdom? Have you seen Harry Lorayne's lecture? He keeps a moist towelette for for that reason. Pretty much the best thing I picked up from there... (kidding of course). Roborto Giobbi also recommends non-greasy creams like 'Sortkwik' or ones sold in office supply stores for bank tellers counting money. Sortwik and the like are effective, but only if used judiciously. Overuse tends to gum up the edges of the deck. 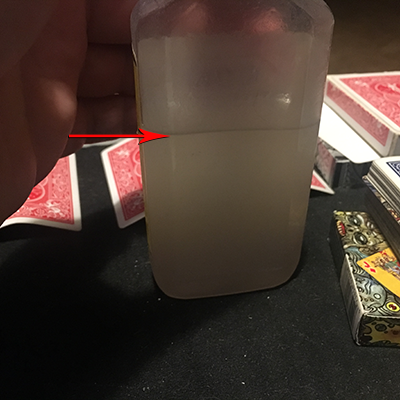 Hint: A dab of Sortwik behind the ear is a convenient source of "stickiness" while handling cards. It appears that you're simply scratching an itch! One thing to try is Chamberlain's Golden Touch. I work at a hospital and between washing and Purell, well dry is an understatement. The GT lasts a while also. Frank Garcia originally told me about it, but later found a large number used it. Vernon, Wagner, even Marlo. On the cover of Marlo Without Tears, is a golden drop in the corner, supposedly representing Golden Touch, but Jon R could give the final word on that. I don't have dry hands, but on MC, the Chamberlain's is what they recommend for dry hands (lots of people complaining about SuckerPunch). I picked some up for my wife, who has extremely dry skin. They've changed the name, this is the link of what I picked up on Amazon. With me, it’s not so much dry hands as cold hands. I’ve done more than several Winter gigs over the years and have spent a fair bit of time sitting on, or holding on to, radiators to warm up. Often whilst wearing gloves. After that, things are fine. Come Summer, and on the occasional hot day we get in the UK, I look for a bowl of cold water. The joys of the circulatory system. I have tried various creams, ointments and preparations, none of which I can recall the name of. But they all felt tacky and, well, unclean. I know they suit some folk, but not me. Regarding the wet napkin touch, I once went through a period of wearing a slightly damp sports wristband. If working jacketless, with short or rolled up sleeves, it does not look out of place. Under a jacket, hidden by sleeve, it doesn’t look incongruous if noticed. Access is covered by the larger movement of adjusting the jacket sleeve. Another vote for Chamberlain's Golden Touch Oil. You can find it online. Amazon has a spray bottle but it's very expensive - $15 plus $4 shipping. Another great one is O'Keeffe's Working Hands. They say, "Guaranteed RELIEF for Dry Hands..."
I've been using it lately instead of Golden Touch. It works very well. Besides creating some adhesion, the substance must not gum up your deck. Only experimentation will tell. Golden Touch and Working Hands both seem to get the job done and not create a sticky deck. Just did a quick google search on these products. Both seem fairly expensive as in the $14 range. Working Hands only requires a tiny amount to get the job done. So the "per application" cost is pretty low. I thought Working Hands left a little bit on the deck after a fair amount of use. Same with Corn Huskers which Fr Cyp really liked. Just used some Working Hands. It does seem that it leaves a bit on the deck. Some shuffling helped smooth it out. But I'm returning to Golden Touch. It wasn't Marlo's choice for no reason! I have been researching this for my own edification and recently found this to work very well. Also more convenient to carry around in the pocket than others mentioned here. It is made by the same company as "Sortkwik" but a difference formula. Last longer and no residue that I have noted after using it for several weeks. Dave, Chamberlain is still making the Original Golden Touch formula. Not sure the difference in the Original and After Bath. https://www.goodnutrient.com Search Chamberlain lotion the link doesn't work for some reason. Decent price and a good way to carry it. @Tom, thanks. I was going by info posted on MC, so who knows what nonsense is being spouted over there. On Amazon the 8 oz bottles are going for $14.95 plus $4 shipping. That's $19 for 8 oz or $2.37/oz. Some time ago, several of us got together and bought a dozen directly. I'll look for a glycerin based oil moisturiser available locally and try a few out. If no luck will order some Chamberlains. Thanks guys. Good to hear it's not an uncommon problem between us cardmonkeys. Hiding a small amount behind the ear rings a bell. Mike, does one application last a gig or practice session. How often would you reapply? Clearly if it's was good enough for Marlo.... especially since Santa might bringing me RCT. I have to reapply every so often. I don't think it would last a 2.5 hr gig. I haven't really timed it out. Maybe I'll get "scientific" and do some research on this. One problem is that each person may have different experiences with regard to longevity. BTW I found a 2.5 oz spray bottle of Chamberlain's GT Lotion online. It was only a few dollars. It might be good to get one of those and then refill from the 16oz bottle. The only one I have used is a Neutrogena (I'm sure ive spelt that wrong but its a very popular health and beauty company) swedish hand cream formula (it has a blue cap). I've tried pretty much everything, but Golden Touch remains my product of choice. After watching Looey Simonoff apply it I realized that a little goes a little way, and a good strong application of the stuff goes a long way. Several sprays and then rub your hands together. Voila! Problem solved. With Working Hands I usually tap my fingers into the container to get a small amount on the fingers in my right hand. I close the container then rub the tips of fingers both hands together. I wait a few minutes then I'll ready to perform. Gary Ouellette has a formula in Close Up Illusions - equal parts Rosewater, Glycerin and Rubbing Alcohol. Works well. Was it Mike Skinner that had a cream he put out called Edge Card? Ordered this, came today and feels great. Thanks for recommending. I received an order of Golden Touch yesterday. I tried it out and my fingertips felt smooth and greasy. I can't see how this is supposed to help you handle cards. I think I'll stick to O'Keefe's for now. I use "Suave" body lotion. Can be found at Walmart. Works good for me. My order of Golden Touch came today and so far I love it. I have extremely dry skin and in Colorado the weather is more often than not dry as hell. Usual lotions leave a very greasy feeling to me. This is working out awesome so far. I think I will have to pick up the travel packs for the car/if going out. I picked up the spray lotion by the way. Not sure which one is suppose to work better. Maybe I should try the actual lotion as well? Also check out Harry Robson's Easy Grip. I tried Corn Husker's Lotion as that's what Fr. Cyp recommended, but I found the glycerin made the cards dirty a little quicker. Just thought I'd update you. Since I read this thread I've been tinkering with different solutions to see what works best for me. As I mentioned previously, I've found that Boots' Glycerin and Rosewater (Boots is a British drugstore) is near perfect. However, I've added a little extra 99% pure isopropyl rubbing alcohol to the mix and that seems to help remove some of the stickiness whilst keeping the tackiness I need; if that makes sense. The bottle actually says there are is also Rosa damascena oil (basically rose oil) in there too. Anyway, I now have both solutions in their own little spray bottles and I'm good to go. I'm now heading out to go and find my masculinity which I think I left somewhere between the home baking and aromatherapy aisles! Gary Ouellet's solution from his book is about the best I've come across and feels almost the same as the Golden Touch Spray above. I'd say Gary's solution loses it's tackiness a bit quicker, but also doesn't gunk the cards if you handle them right after applying. The Golden Touch spray does carry over to the deck if you handle them right away, but lasts a bit longer. I have found that once the Golden Touch dries a bit, it doesn't gunk up the cards. They continue to fan and spread cleanly. I won't use anything that gunks up the cards. I did find that the Golden Touch spray was gunking up my deck a bit too much and was a bit too tacky for me. I know dilute it with about 2/8 water to Golden Touch (spray). I find that I might have to apply two sprays compared to one, but at least it isn't overly tacky. I work in a hospital and between Purell about a couple dozen times a day along with the same amount of washings, dry is an understatement. Add the cold, dry New England air and I just about need Superglue. Since that's not too practical, the Golden Touch works great at full on tack. Like Mike said a couple of moments to dry and no damage to the cards. As stated previously, I have found this stuff to be portable, fast-acting and does not leave a residue on cards. Usually last about an hour but its ease of application makes it easy to re-apply and does not leak in my case like some of the liquid tried earlier. You can mix your own. You may change the proportions for your particular hands. I find Golden Touch works well. Also use Magician's Choice (available from Penguin) but it is glycerin based so you have to use it sparingly (but wow - great control!). I'm a big fan of Corn Huskers. I bought a bottle over 2 years ago when I was visiting my family in America and I haven't used even half of the bottle. Perhaps you used too much? Personally, I use a drop approximately the size of half a US dime and it does fantastic for me.